Last week I was a bit soured on People. Some friendly neighborhood car-parker felt the need to push my car back three or four feet to make room for his (sorry, but I do think it was a guy) much larger car. He PUSHED it back while I had the emergency brake on. Crazy. I have a very artsy dent on my bumper, and the fancy license plate frame (free from the dealer) is broken into four pieces. Besides all that, he was still parked too close to the fire hydrant, but I guess the PAL license plate and stickers protect and serve more than neighborly actions. Anyway, today sweetened my mood. I had taken my toddler to Key Food to pick up a few things for dinner, and somewhere between the arugula and the pie crusts, his hat went missing. I guess I was too distracted with winning at the stroller slalum course up and down the aisles. It's the cutest hat ever. In fact, it's so cute that I get a little embarrassed when I put it on my cherub's head. I prefer the less flashy side, but that baby loves the duck, or the "Quack Quack," as he calls it. Once I'd carried the stroller up the stoop stairs and folded it up and brought the groceries and my son into the apartment, I realized that the duck was missing. I trotted back down to Key Food with babe in arm to see if it was anywhere to be found. It wasn't. I asked the very pleasant cashier. I asked the manager. I scooted up and down the aisles. I'll even admit I gave a side-long glance at several carts to see if it had been found by a fellow admirer of ducks. Nothing. On my way home, I ran into a neighbor who spends a good amount of time on the block. He hadn't seen it either, but he said he'd keep an eye out. 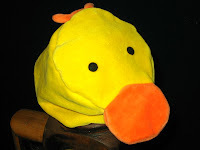 Pretty much, I had already started to come to terms with a life without the duck hat. Oh well. It wasn't a tragedy, but we never even had much of a chance to wear the hat! Long enough story short, after about 15 minutes of reading The Very Hungry Caterpillar and throwing a few balls around the place, our doorbell rang. I figured it was another delivery for my downstairs neighbor. I think it's her birthday this week; she's already gotten two fancy cards and a FedEx package. As I went down to answer the door, I saw the neighbor with whom I had chatted about the missing hat. He was holding a Key Food bag...and the hat was in the bag. Hooray for neighborly behavior! Hooray for people who turn things into the Lost & Found at Key Food! Hooray for doing the right thing and then some. It turns out, I had been too quick about getting back to the Key Food. The hat was with the cashier and when my neighbor asked about it, they very excitedly and happily gave it to him to bring back to us.